A new scam on Facebook has reappeared – account cloning. It has been spotted in 2012 and now users have posted complaints that the scam is back again. The scam has already affected some people and scammers have obtained money using fraudulent practices. A Fox News insider report has indicated that this Facebook scam is primarily associated with Facebook account cloning. First, the criminals may use a fake profile of someone who the user is likely to add(like a beautiful woman) to see more details about the account the friends list of the account as well. What the then scammers do is that they completely copy the targeted profile to the slightest detail so that it becomes identical. The cyber-scammers then begin to add people in your friend-list with the expectation that the people in your friend list recognize the duplicate profile and they believe that it is real. After this is done, the fake profile may write to the users and cause numerous damages to them. One of the consequences of adding such a fake user account is that the account may send you malicious web links that may infect your computer with very dangerous malware, like Infostealer Trojans, Rootkits and even Ransomware Virus. Such ransom viruses usually encrypt the files on the compromised computer and ask the victim for money to get them back in the form of BitCoin. Another consequence which has been reported by affected users is that the cyber-scammers were sending out messages related to requests for immediate payments. For example, the cyber-criminal may write to you from the fake profile that he was involved in an accident and needs several thousand dollars to pay his bail and other charges. The scammers may also ask the user to call fake numbers or subscribe his device to SMS fraud services which can result in an unexpectedly large phone bill. The cyber-criminal may set up a meeting with the user for one or other malicious purpose. Cyber-crooks may ask for financial and personal information such as your credit card details or social security number. After some time, the cyber-criminals can duplicate the account and report the other Facebook account for fake, meaning that they can “steal” your Facebook identity. Add friends to your friend list to send them malicious files and web links as well as scam them using social engineering techniques. Write to your friends anything they wish. Advertise to users’ applications that may steal credentials. Advertise groups to users and send fake notifications to them which can lead to malicious websites, like the latest Facebook Virus. The scam has primarily been reported to affect countries in the United States and Central Europe as well, like Netherlands for example. Users who see friend requests from someone who is already in their friends’ list should immediately check in with the original Facebook user of the account. If there is a scam going on, it is strongly advisable to notify all of the users in the friends list of the compromised account via a shared message or a status update or any other means. Make your friends’ list private for others. Always do a quick check on accounts which add you. The bottom line is that Facebook scams may never stop appearing because they usually tend to work. It is a fact that for a while now, this has been the biggest social network on the planet Earth and its users are subjects to numerous scams and malware attacks worldwide. Threats such as Facebook Scam may be persistent. They tend to re-appear if not fully deleted. A malware removal tool like Combo Cleaner will help you to remove malicious programs, saving you the time and the struggle of tracking down numerous malicious files. Threats such as Facebook Scam may be persistent on your system. They tend to re-appear if not fully deleted. A malware removal tool like SpyHunter will help you to remove malicious programs, saving you the time and the struggle of tracking down numerous malicious files. Note! Your computer system may be affected by Facebook Scam and other threats. SpyHunter is a powerful malware removal tool designed to help users with in-depth system security analysis, detection and removal of threats such as Facebook Scam. 1. Install SpyHunter to scan for Facebook Scam and remove them. 2. 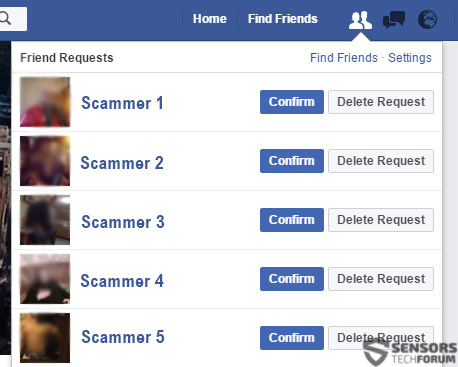 Scan with SpyHunter, Detect and Remove Facebook Scam. Ransomware infections and Facebook Scam aim to encrypt your files using an encryption algorithm which may be very difficult to decrypt. This is why we have suggested several alternative methods that may help you go around direct decryption and try to restore your files. Bear in mind that these methods may not be 100% effective but may also help you a little or a lot in different situations. Note! Your computer system may be affected by Facebook Scam or other threats. Remove Facebook Scam by cleaning your Browser and Registry. Fix registry entries created by Facebook Scam on your PC. Combo Cleaner is a powerful malware removal tool designed to help users with in-depth system security analysis, detection and removal of threats such as Facebook Scam. Step 5: In the Applications menu, look for any suspicious app or an app with a name, similar or identical to Facebook Scam. If you find it, right-click on the app and select “Move to Trash”. Step 6: Select Accounts, after which click on the Login Items preference. Your Mac will then show you a list of items that start automatically when you log in. Look for any suspicious apps identical or similar to Facebook Scam. Check the app you want to stop from running automatically and then select on the Minus (“–“) icon to hide it. Remove Facebook Scam – related extensions from your Mac’s browsers. A pop-up window will appear asking for confirmation to uninstall the extension. Select ‘Uninstall’ again, and the Facebook Scam will be removed. When you are facing problems on your Mac as a result of unwanted scripts and programs such as Facebook Scam, the recommended way of eliminating the threat is by using an anti-malware program. Combo Cleaner offers advanced security features along with other modules that will improve your Mac’s security and protect it in the future. Hey !, I found this information for you: "New Facebook Scam – Fake and Duplicate Accounts for Fraud". Here is the website link: https://sensorstechforum.com/new-facebook-scam-fake-duplicate-accounts-fraud/. Thank you.